Something I've discovered as I hit my 30's and my skin started aging, is that my skin responds better to less product. I love Asian skincare products, and I enjoy a lengthy routine sometimes, but my skin does not need a 10 step routine on a daily basis. Even as my skin has changed from oily to combo, it all comes down to layering the right products together to get results, not the number of products in your lineup. 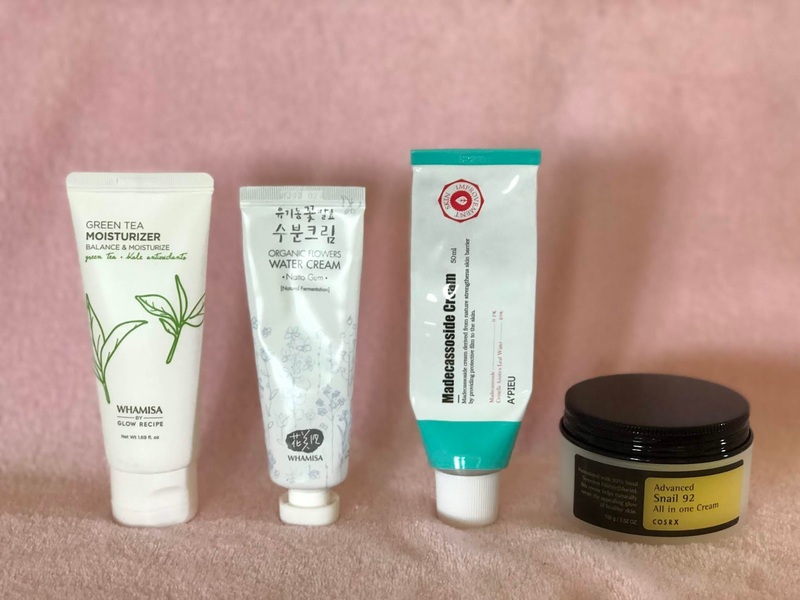 In this post I want to show my favorite products that work well with my combination acne-prone skin. I don't use these products or steps daily - I pick and choose what I want depending on my mood and what I feel that my skin needs. Sometimes that means three steps, sometimes that go all out and apply 10 or more steps. 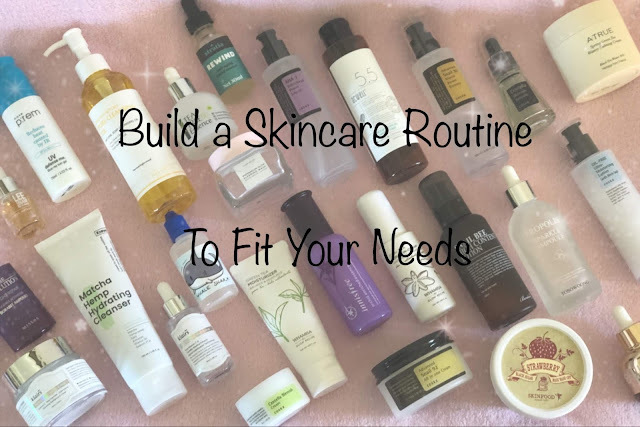 But no matter what, I only use what I want to use, and never allow myself to feel obligated to have a large routine, or like I need to use a vast assortment of products (no matter how much I enjoy them). Note: a few links in this post (marked with an asterisk) are affiliate links, and I will receive a small commission if you choose to make a purchase using them. Cleansing comes in two parts: an oil based cleanser and a water based cleanser. Generally speaking, an oil based cleanser is going to be used to remove makeup, sunscreen, sweat, and excess oils and grime that have built up during the day. Many people feel that they do not have a need for an oil cleanser, but I've discovered over the past few years that my skin gets much cleaner and also breaks out less if I do follow a double cleansing routine, and give my water based cleanser a better base to start out on. So of course this means that a water based cleanser is going to be used in both your morning and evening routine, where-as the oil based cleanser would only need to be used in your evening routine. Using a water based cleanser with a lower pH (of about 5.5, but I recommend anywhere from 5-7 as a basic rule) is going to help balance your skins' natural bacteria and moisture barrier, and help protect your skin from irritation. 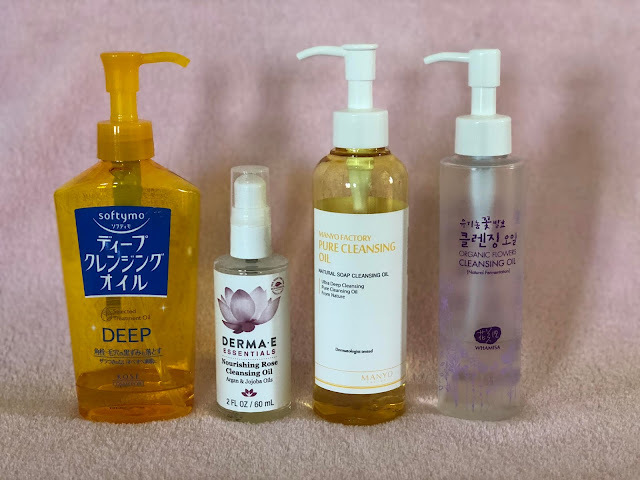 The oil cleansers I've found work best for me are the Kose SoftyMo Deep Cleansing Oil, Derma-e Nourishing Rose Cleansing Oil (not an Asian product but it really does work amazingly), Manyo Factory Pure Cleansing Oil, and the Whamisa Organic Flowers Cleansing Oil. 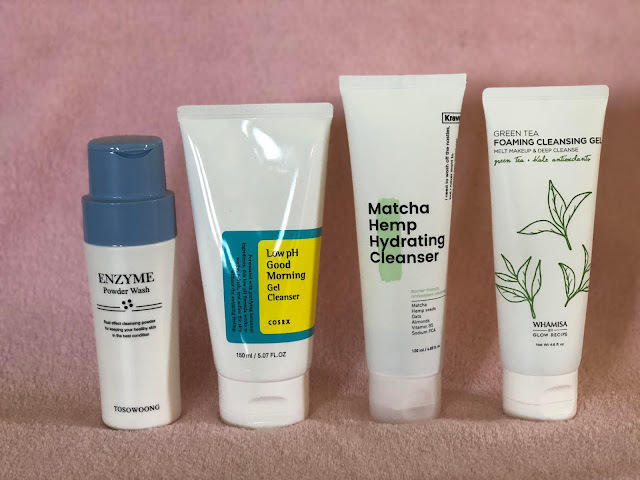 The water based cleansers I have found to work best for me are the Tosowoong Enzyme Powder Wash, Cosrx Low pH Good Morning Gel Cleanser, Krave Matcha Hemp Hydrating Cleanser, and the Whamisa Green Tea Foaming Cleansing Gel. Alternatively, I sometimes skip traditional cleansing all-together in the morning and opt for a cleansing water, which you just apply to a cotton pad and wipe across your face, using new clean cotton until it's clean. Regardless of how many I try, my favorite is consistently the Son & Park Beauty Water. 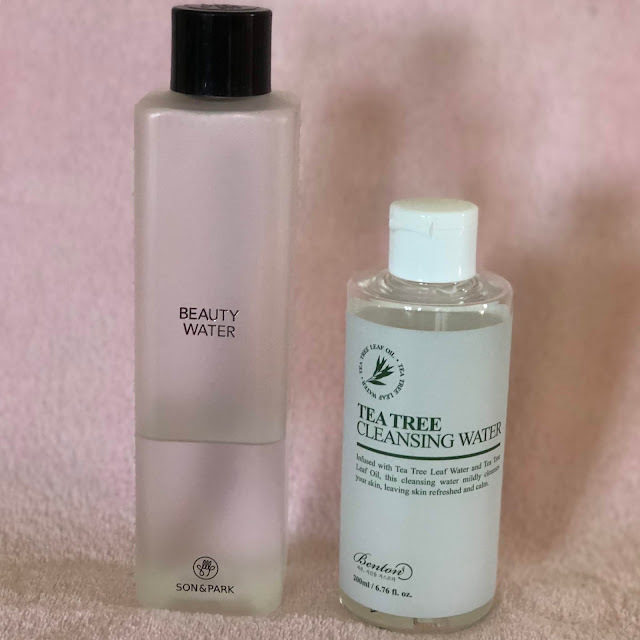 However, the Benton Tea Tree Cleansing Water is a slightly more affordable option. Exfoliating, whether it be chemical or physical, seems to be a crucial part of my routine if I want clear skin. I use my Clarisonic Mia* most evenings, but opt for a scrub once a week, and use my PMD Personal Microderm* once a week as well. 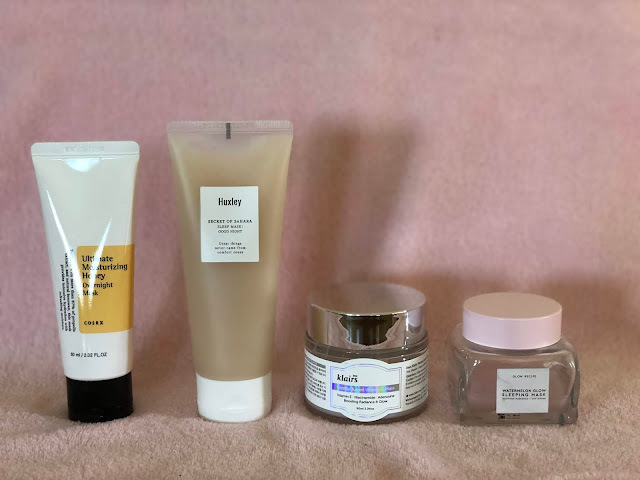 Of course exfoliating isn't for everyone - but if you are like me and your skin needs a little help sloughing off that outer shell once and a while, here are some more affordable alternatives to electronic devices. For a scrub I highly recommend the SkinFood Black Sugar Mask as a very basic and affordable option, however the SkinFood Black Sugar Strawberry Mask is also good but a bit more gentle if you find a straight sugar scrub to be too harsh for your skin (it also smells delicious too!). 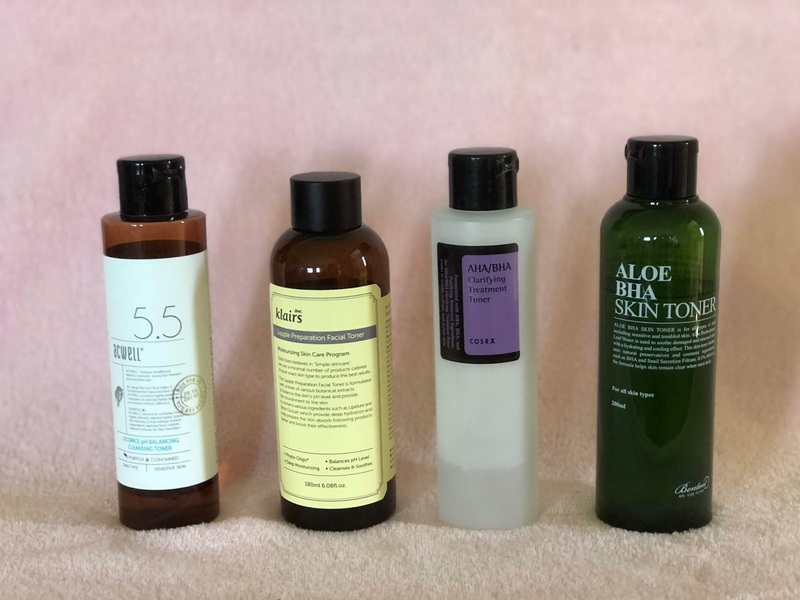 Chemical exfoliants get a little more tricky, and can do just as much damage as (if not more than) a physical exfoliant if used too often, too strongly, or incorrectly. That being said, I still use gentle acids on my skin often. Note: while sun protection is always important, it's even more crucial when using acids as they will make your skin much more sensitive to sun damage. Vitamin C will help brighten, and fade sun damage - best used in the morning, or at night if you're not using AHA or BHA. I recommend the Melano CC Essence which is both affordable and effective, and has the best formulation of options I've personally tested so far. Some people feel it's not strong enough to be effective, but I often suggest the Klairs Freshly Juiced Vitamin Drop as a beginner to vitamin c products as it's gently formulated and quite stable as well. AHA (alpha hydroxy acid) will help will help fade surface issues such as pigmentation and whiteheads - best used at night on alternative nights as a BHA if you're using both. 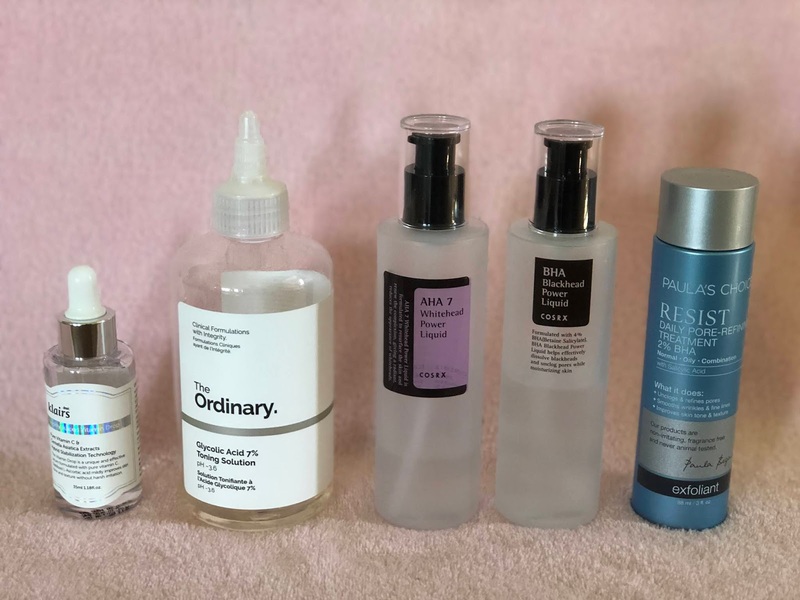 I use The Ordinary Glycolic Acid 7% Toning Solution which is a very low concentration and basic formulation, and works well as a low pH toner - but I find it's perfect for daily use when you have sensitive skin. I also find the Cosrx AHA 7 Whitehead Power Liquid is a great option. BHA (beta hydroxy acid) will help loosen up sebum and unclog congestion inside pores, working everything to the surface (which is why most people use both AHA and BHA, because they work together to push things out of the skin) - best used at night on alternative nights as using an AHA, or in the morning if not using vitamin c. I personally like both the Cosrx BHA Blackhead Power Liquid and the Paula's Choice RESIST Daily Pore-Refining Treatment With 2% BHA. Toners and FTE's have similar jobs in a routine to prep your skin with light amounts of moisture so your skin acts like a sponge. If you have a dry sponge and you try to absorb a small puddle, you'll push liquid around until the sponge begins to absorb. If you first dampen a sponge, however, it easily absorbs more moisture with each pass. This is not to say they don't have their differences - where toners also help balance your skins' pH level and hydrate, and FTE's also help hydrate as well as brighten. FTE's are also mainly composed of ferments and yeast which help soften skin and your complexion, but those sufferings from fungal acne will find they need to avoid such products. 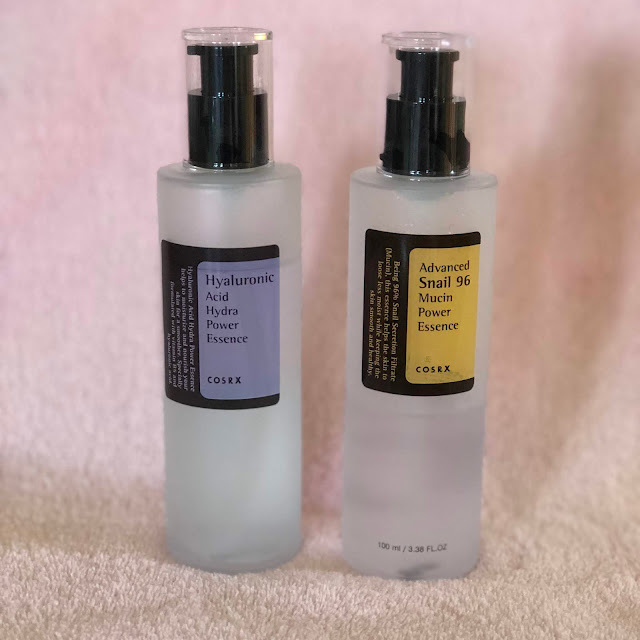 I have had to best luck with the Acwell Licorice pH Balancing Cleansing Toner which is a liquid toner that can also be used as a hydrating mist and cleansing water. I also like the Klairs Supple Preparation Facial Toner with a thicker consistency. The Cosrx AHA/BHA Clarifying Treatment Toner and Benton Aloe BHA Skin Toner are also nice. First Treatment Essence's are something I have mixed feelings about. I enjoy them, but recently I've suspected they do contribute to my acne at times, so I don't use them often, more as a "special treatment" for my skin once a week. I absolutely adore the SK-II Facial Treatment Essence* though I do suggest purchasing smaller sizes so it doesn't seem to terrible on the pocket-book as the full size does. 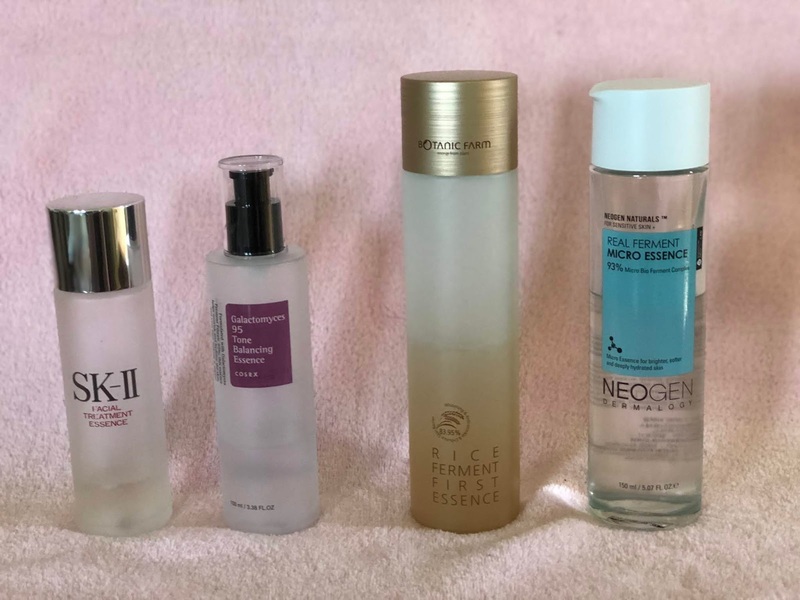 Alternatively the Cosrx Galactomyces 95 Tone Balancing Essence, Botanic Farm Rice Ferment First Essence, and the Neogen Real Ferment Micro Essence all do an excellent job at a fraction of the price. This portion of any routine is where things can get out of control and lengthy quite quickly. These products may be labeled differently, but they are all interchangeable and do not need to be applied in the order of their names - these steps are applied in order from thinnest to thickest for maximum absorption. The most common benefit of any of these is hydration, as well as brightening, firming/anti-aging, calming/anti-acne, and barrier repair/protection. I see people often confused between the difference of regular essences and first treatment essences - and the most notable differences are texture - FTE's are watery and help prep skin for absorption, and essences are a bit thicker with a more specifically targeted ingredients. Luckily enough, if you don't know the difference off hand, FTE's will often have a wording like "First Treatment," "Starting Treatment," or "Special Treatment" in the name. For hydration I find that those with hyaluronic acid as a main ingredient work the best - HA can hold over a thousand times worth its weight in water, and allows it to penetrate deeply into the skin, keeping it there to hydrate over time and plumping your skin at the same time. HA can make a formulation sticky though, and make it difficult not only for the product itself to absorb but also the products applied afterwards. My favorites include the Cosrx Hyaluronic Acid Hydra Power Essence and the Manyo Factory Ultra Moist Rebirth Ampoule. The Cosrx Advanced Snail 96 Mucin Power Essence is a classic k-beauty staple, and not only hydrates but helps repair skin with snail mucin filtrate. When it comes to brightening two ingredients come to mind: niacinamide and arbutin. Vitamin c is of course a great brightening ingredient as well, but as mentioned earlier in this post I feel it's more of an active than a serum step. 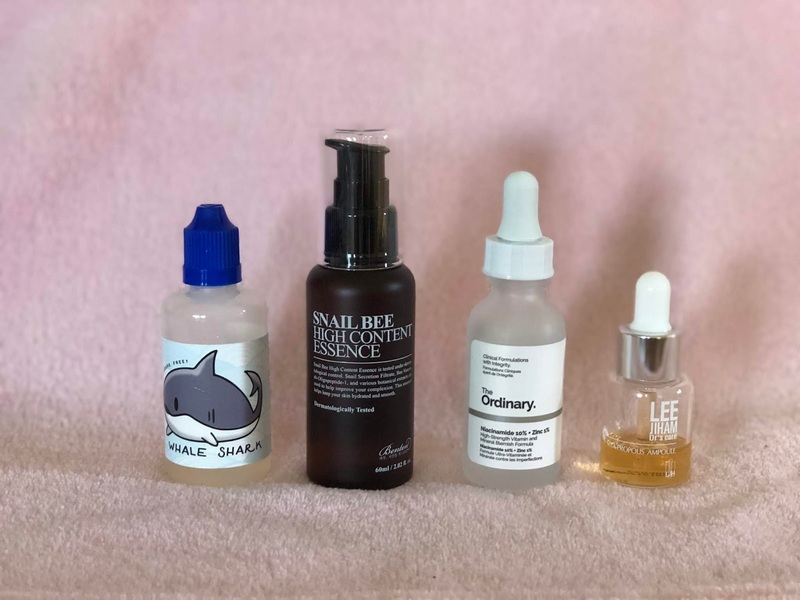 I've been using the Holy Snails Shark Sauce for quite some time now, and find it's a great brightening serum that also helps repair the skins' natural moisture barrier. I've found the Benton Snail Bee High Content Essence, The Ordinary Niacinamide 10% + Zinc 1%, The Ordinary Alpha Arbutin 2% + HA, and Leegeehaam Vita Propolis Ampoule are all nice options if you're looking for a good brightening or "glow" effect. Products that help with signs of aging have been a bit more difficult for me to find. Not that there aren't any available, but more that I've had a hard time finding any that seem to help my fine lines. 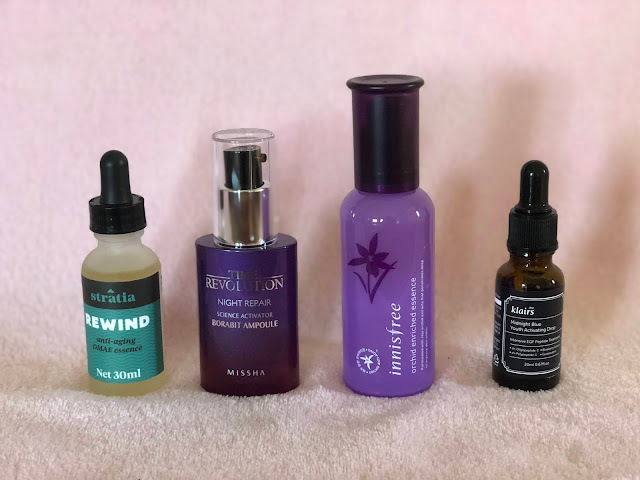 So far I've had the best results with Stratia Rewind which doubles as a powerful brightening serum, the Missha Time Revolution Night Repair Science Activator Borabit Ampoule, the Innisfree Jeju Orchid Enriched Essence, and the Klairs Midnight Blue Youth Activating Drop. 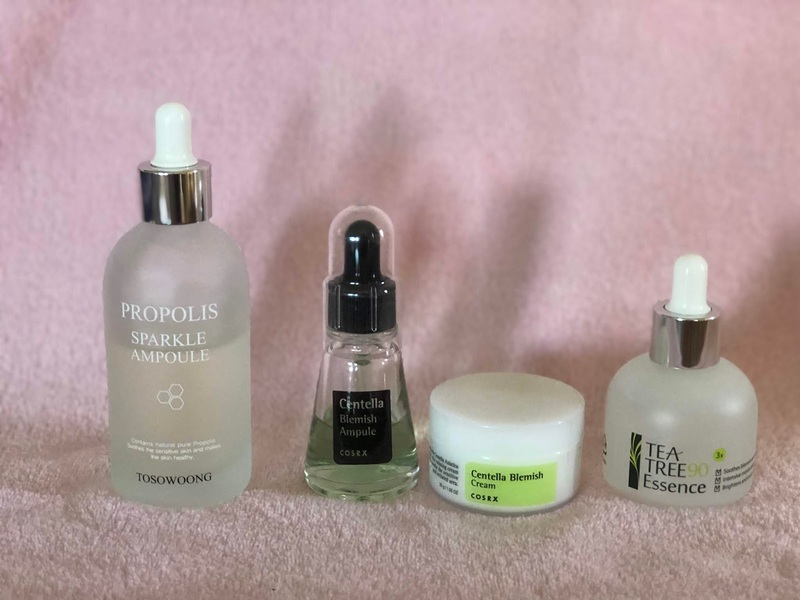 When I look for a product that will help calm irritate or soothe an acne breakout, I tend to lean towards centella or honey based products. 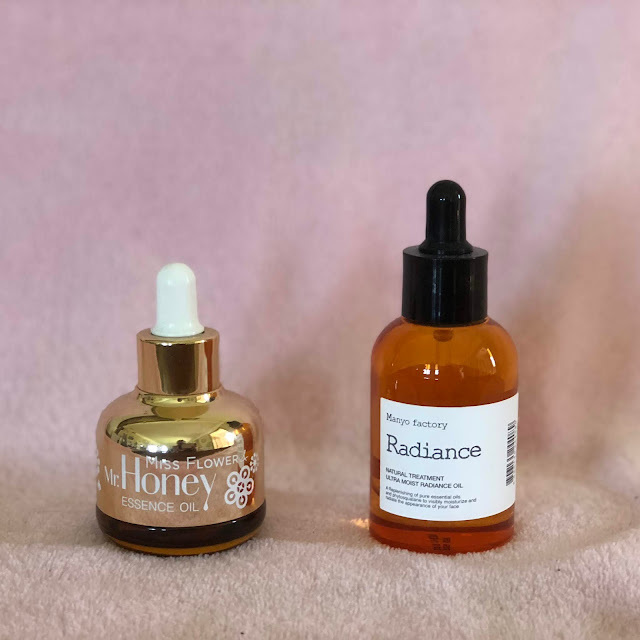 The Scinic Honey All In One Ampoule and Tosowoong Propolis Sparkle Ampoule both soothe irritation and help protect the skin while containing natural antibiotic properties that fight acne bacteria, as well as hydrate and brighten your complexion. The Cosrx Centella Blemish Ampule hydrates and calms irritated skin while soothing redness and inflammation - and when paired with the Cosrx Centella Blemish Cream as a spot treatment, it not only helps clear up acne spots but also hyper-pigmentation and scarring more quickly as well. Something that hasn't worked perfectly for me, but I see many rave about it the Leegeehaam Tea Tree 90 Essence which uses 90% tea tree extract (not oil) along with centella and sea buckthorn extracts to calm a variety of skin troubles, including acne. If you have compromised your moisture barrier, have rough or irritated skin, or you feel your skin is dehydrated and damaged - products with ceramides are going to be your best-skin-friend during this healing process. I am absolutely in love with the Holy Snails Snowbang Essence which contains 5% ceramides along with some great hanbang ingredients like ginseng and licorice root to help soothe and brighten while healing your skin. 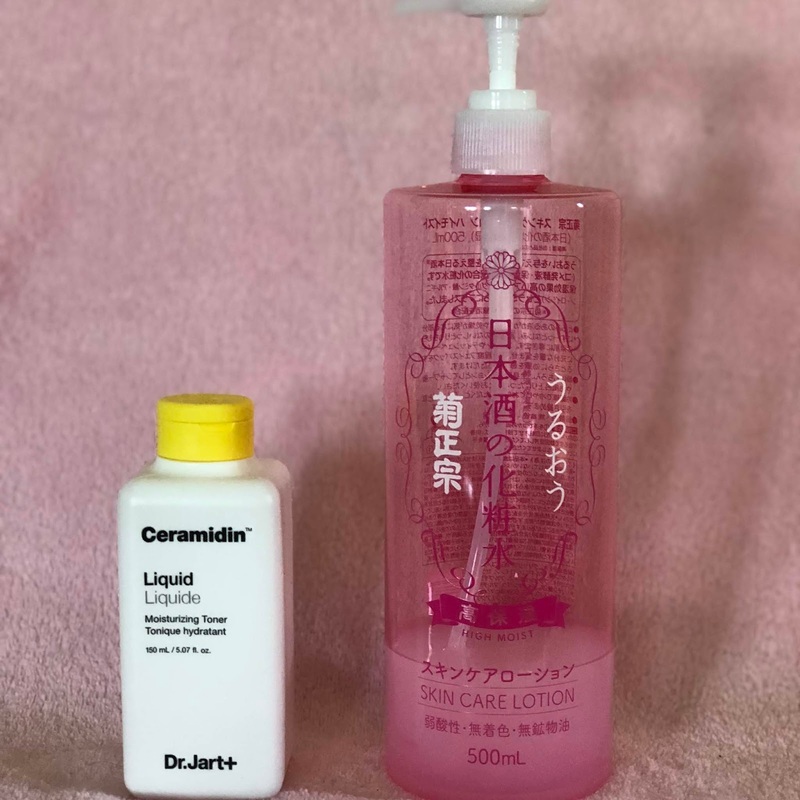 The Dr Jart+ Ceramidin Liquid* is another nice essence-type product that is full of those wonderful ceramides, and will also help calm and hydrate dehydrated skin. Alternatively, the Kikumasamune High Moist Lotion comes in a large pump bottle, is chock full of ceramides and hydrating ingredients, but is light and liquid like a toner - I actually use this on my sons' eczema and it does wonders for both our skin! 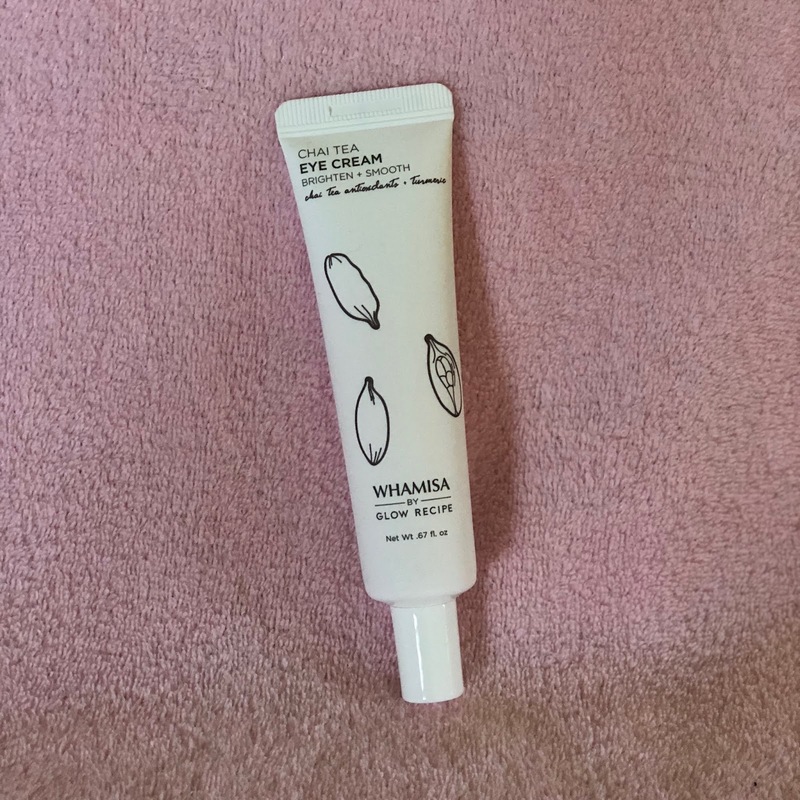 I don't use eye creams as much as I should - I was very much part of the "use your face cream under your eyes" crowd, up until the point where my under-eyes really started looking like garbage and I realized they needed some extra TLC. 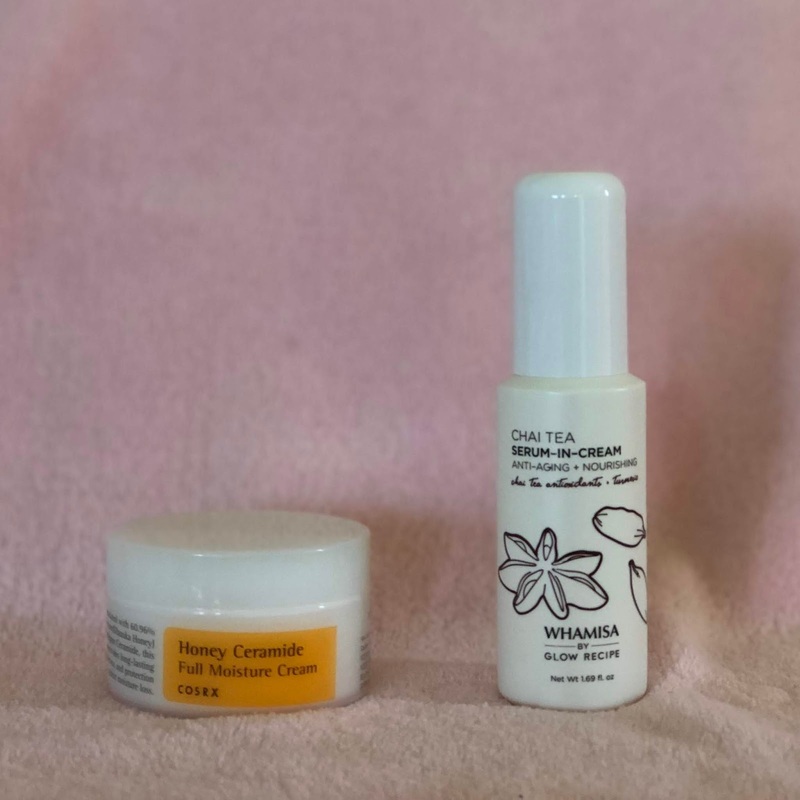 I've been enjoying the Whamisa by Glow Recipe Chai Tea Eye Cream for brightening and smoothing fine lines. I also have repurchased the Manyo Factory Caviar Vita Eye Gel several times (until recently, when I switched to Whamisa) and found it was great for oilier skin or if you just need to give your eyes a more awake and youthful look. I've found moisturizers to be a very personal part of my routine - not that picking and choosing other products isn't personal, but for me my moisturizer changes almost daily based on what I need and what I apply beforehand. On the lighter end of the spectrum you will find items like emulsions - these are sometimes used to end a routine for someone with oily skin, or as a step before a heavier cream for someone with dry skin. 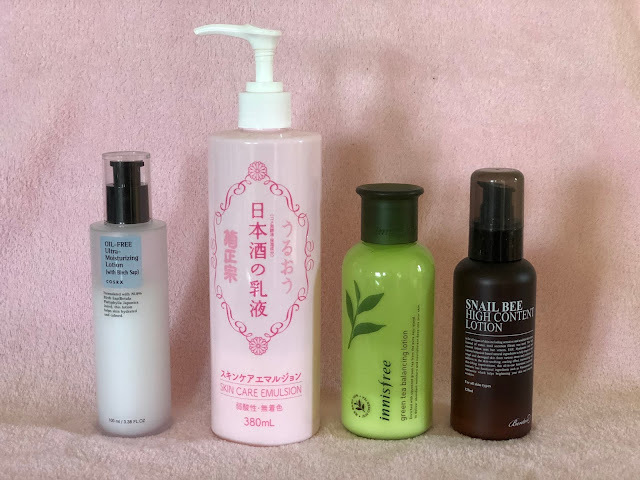 My personal favorite is the Cosrx Oil Free Ultra Moisturizing Lotion , but I also enjoy the Kikumasamune Sake Milk and Innisfree Green Tea Balancing Lotion. A product I enjoy but cannot use often (due to an ingredient I can't seem to narrow down) is the Benton Snail Bee High Content Lotion - it absorbs beautifully into my skin but something about the snail bee products in this line break me out after too much use. Next up are gel moisturizers - they're thicker than emulsions but absorb into the skin quickly and easily without leaving a greasy feeling behind. Again, they may be too lightweight for drier skin types, but for my combo skin they're perfect for daytime! I am absolutely in love with the Rosette Ceramide Gel. 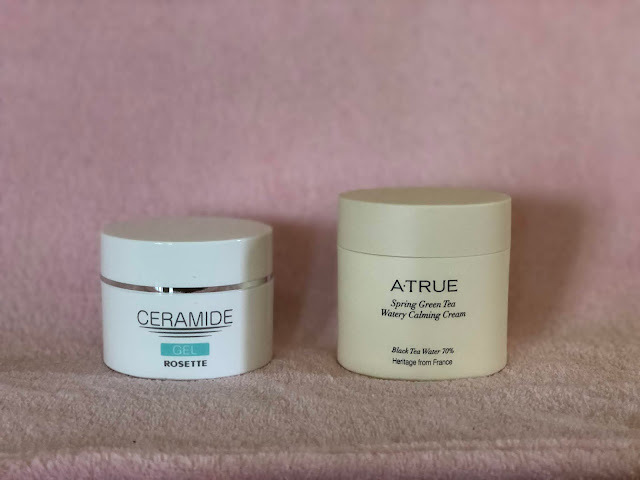 I recently started using the A.true Spring Green Tea Watery Calming Cream and it is not only hydrating but also calming when my skin is acting up. Moving on to lighter-weight creams, I really enjoy the Whamisa by Glow Recipe Green Tea Moisturizer which is a bit watery but great for combination and oilier skin. Similar in watery cream texture is the Whamisa Organic Flowers Water Cream with Natto which is advertised for dry skin types, but I like it for combo skin as well. The A'pieu Madecassoside Cream is great for acne prone skin as it contains centella to soothe plus niacinamide to brighten spots. Of course a classic favorite among the AB community for lightweight moisturizers would be the Cosrx Advanced Snail 92 All-in-One Cream which not only packs a hydrating punch in a snail-slimy cream, but also helps with signs of aging, skin repair, and healing acne. I tend to use heavier moisturizers on days where my skin is more dehydrated, or overnight when my skin just soaks everything in and I don't care how long it takes because the results the next morning are always great. The same can be said for sleeping packs but we're not that far yet! I've consistently had good luck with the Cosrx Honey Ceramide Full Moisture Cream for a few years now, and love that it hydrates and repairs my skin with the help of ceramides and honey extract. The Whamisa by Glow Recipe Chai Tea Serum-in-Cream I initially felt underwhelmed with, but with consistent use I found it's not only an easily absorbed thicker moisturizer for either day or night, but does help firm up fine lines over time. I also repurchased the SkinRx Lab MadeCera Cream a few times, and it also contains ceramides (10,000ppm) as well as madecassoside to hydrate, repair, brighten, and smooth fine lines. I don't use oils often, if I'm being completely honest. My favorite was the Banila Co Miss Flower and Mr Honey Essence Oil, but it's been discontinued. The Manyo Factory Ultra Moist Radiance Oil works ok for me, but it's a bit heavy unless I mix a few drops with a cream. I'm not going to lie, sunscreen is my least favorite skincare product - which is sad considering how important it is! But truth be told I've had terrible luck on my road to finding a sunscreen that works for me without breaking me out or burning my skin. 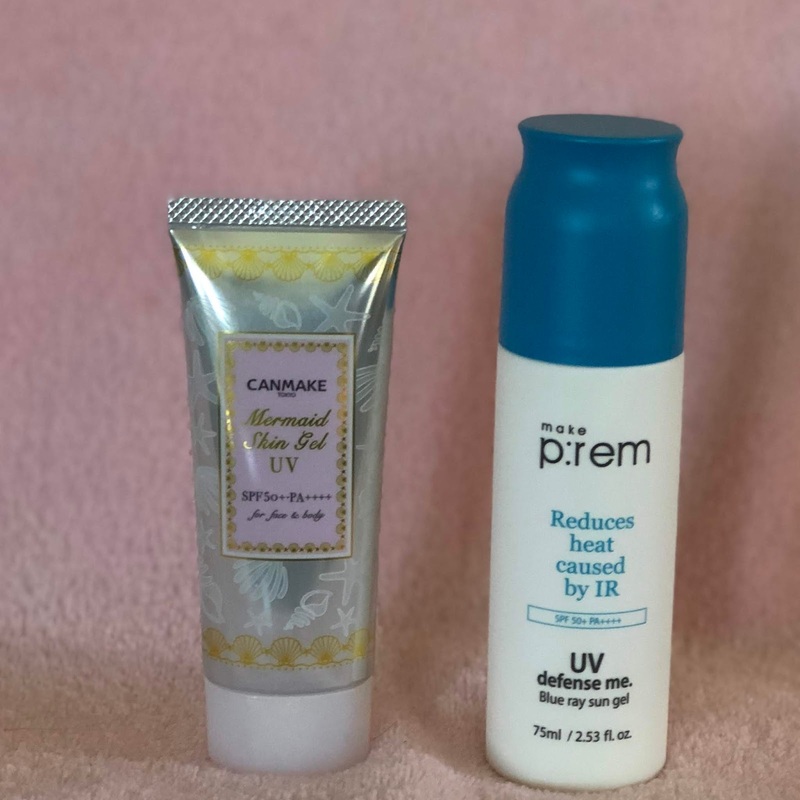 I've had the best luck with the Canmake Mermaid Skin Gel UV* (seller GoGoNight555) but I also starting using the Make P:rem Blue Ray Sun Gel and it seems to be going ok so far too! 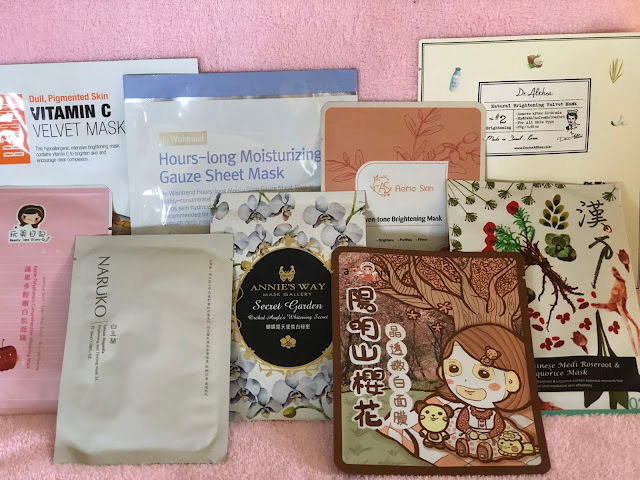 Sheet masks are another product that you definitely don't need to use every day (though I have to say, daily masking was the best thing I could do for my severely dehydrated skin when I first jumped into Asian skincare) but they're a great treat, and even if I don't mask every day now I still mask at least three nights a week. You can honestly slip this step anywhere into your routine you wish - I like to mask either after toner/essence or right before my moisturizer. Just do what feels right to you. I don't have recommendations - I've tried hundreds of different masks and I disliked a small handful. 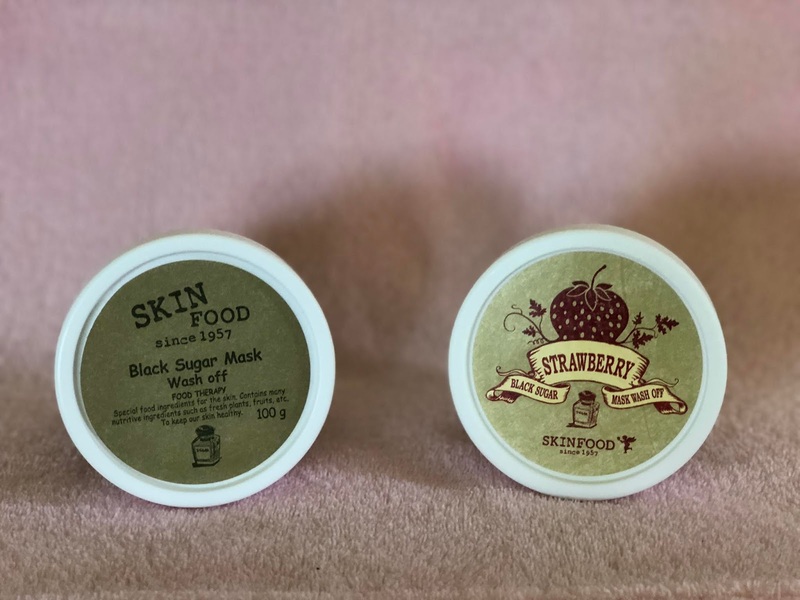 I do, however, recommend not spending more than a few dollars on single masks until you find what you like for yourself and if you find it helpful for your skin. I truly hope you've found this layout helpful - I know it looks like a lot to take in, but I really just wanted to show you that it's easy to pick and choose parts of all the products available and only use what your skin needs - whether it's two products, or twenty... don't ever feel like you need to do what everyone else does. Always listen to your skin! Disclaimer: No monetary compensation was received for this post. This blog will always provide honest opinions, beliefs or experiences on products reviewed. If you have any questions, please contact me at gothickornchic at gmail dot com. This post may contain affiliate links and I may receive a small commission if you make a purchase using one of those links - which costs nothing to the consumer but does help this site. The disclosure is done in accordance with the Federal Trade Commission 10 CFR, Part 255 Guides Concerning the use of Endorsements and Testimonials in Advertising.